Dogwoods, Living Christmas Trees, Japanese Maples, Tulip Magnolias, and other Oregon stock arrived today. We have White, Pink, and Cherokee Brave (Dark Rosey Pink) dogwoods in now. Just arrived. In #10 gallon pots. 3-4 ft. are $125, 4-5ft. are $140. We also have a nice selection of Colorado Spruce and Dwarf Alberta Spruce. Also just got in some Peony’s, and Exbury Azaleas (deciduous azalea), Helleborus, Tulip magnolias, some very nice Japanese Maples, and some Rhododendrons, Mugho Pines, and other Oregon Stock. And below is a picture of Chester and Jessie when they were about two months old. Now they are 8. Not plant related but very cute puppies. Great dogs now. Always happy to see everybody. Bare Root Berries and Vegetables are now in. Artichoke, Green Globe $4.95 ea. Rhubarb, Victoria Cherry $4.00 ea. Blueberries, Figs, Pomegranates, Dogwoods, Live Christmas Trees should be in next week. I will send out an email when items arrive. WE ARE OPEN WITH REGULAR HOURS: DAILY 9 TO 5, SUNDAY 10-4. We have Erosion Control seed and Annual Rye seed to use to stabilize areas that were burned. We were fortunate and the fires were held about one to two miles from us. We did get evacuated and were not able to conduct business for several days, but we are now past that and open with regular hours and a full inventory for fall planting. For areas that may have been burned, we carry quick cover erosion control seed mix and annual rye seed for customers who may have been in the burn areas and need to stabilize areas for the winter. These both come up quickly and will help to stabilize burned areas for the winter. Erosion control mix is $2.60 per pound. A pound covers 1200 sq. ft. or 35 lbs. per acre. Annual Rye is $1.10 per pound and a pound covers 100 sq. ft. It is 435 lbs. per acre. We generally have a couple hundred pounds of each in stock. If you are in need of seed for erosion control, please let me know and we can order it if we don’t have it in stock and have it within a week or so. REMEMBER THAT FALL IS THE BEST TIME FOR PLANTING! We have a large selection of trees and shrubs for fall planting. With the cooler nights and still warm days, plants get well established in the fall and over the winter and will thrive next spring and summer. We are helping two teachers from Foothill School raise donations to help those impacted by the fire in our community. I am paraphrasing what they are doing but this is it. Two Foothill School teachers will be doing a donation drop off drive thru behind the Edward Jones office on First Street in Marysville on Saturday the 14th from noon till 4 pm AND WE WILL BE ACCEPTING DONATIONS NOW THROUGH SUNDAY THE 15th. We are accepting new items from clothing, to pet supplies, to livestock equipment, kids sporting goods, household linens, any and everything you can think of that is new that will help. We will also be accepting Gift Cards and an account is being set up for cash donations. These two teachers have asked us if we can help and we are acting as a drop off location to help with the kids and others with recovery from this devastating fire. We are offering 15% off all in stock purchases now through Sunday with the donation of a new item for this cause. 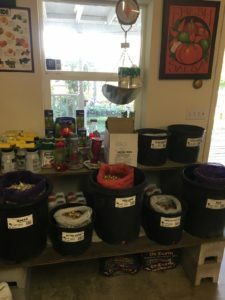 If you don’t need any plants, you are welcome to drop off donations anyway. Yellow, Red and White onions – $2.35 / pound, Sweet onions – $4.50 / pound. All available now for fall planting. Cooler weather ahead. Shorter days, cool mornings. FALL PLANTING SEASON IS HERE. Winter vegetables are now in as well. Free fruit tree pruning classes this Saturday and Sunday January 28th and 29th @ 10 am each day. Attend either one or attend both. we will have one more class on Saturday the 4th of February. Learn how to prune your fruit trees. We will hold the classes in our orchard here at the nursery. No registration neccesary. Just show up. Free coffee, tea, and hot chocolate during the class and bare root season. We will also cover rose pruning and dormant spraying and answer any questions you may have. Bare Root season continues through the end of February. Great selection of bare root fruit trees and roses and shade trees. Blueberries, Raspberries, Blackberries, Asparagus, Artichokes, and Strawberries all available now as well and onion starter plants and seed potatoes. And of course our full line of shrubs, trees, and plants. Hours: 9 to 5 Monday through Saturday, 10-4 Sunday. 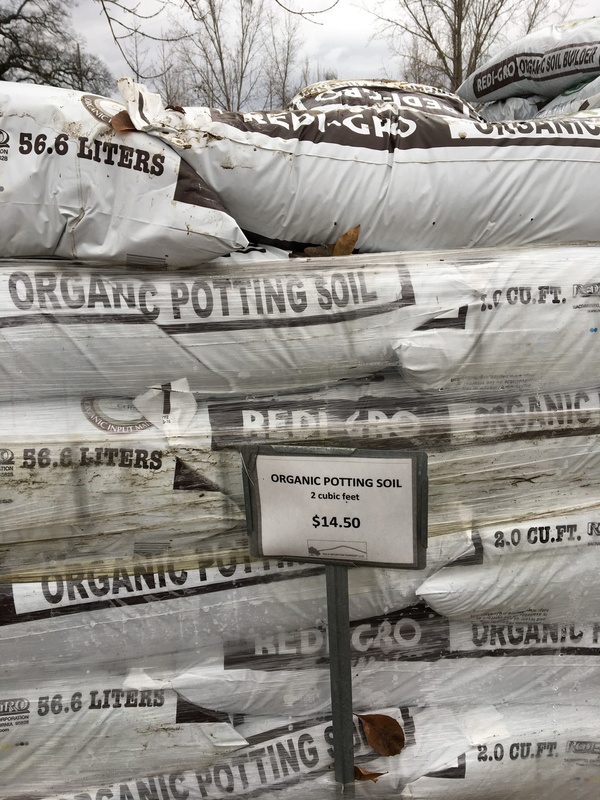 Wet Weather Special: Get One Bag Of Organic Soil Amendment 1/2 Price For Every Two Bare Root Fruit Trees Purchased And Picked Up Now Through January 16th. 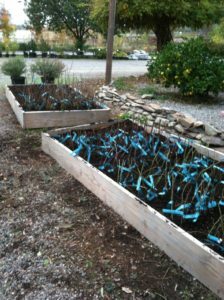 Buy two or more bare root fruit trees at regular price, and get organic potting soil or organic soil builder for 1/2 price. Limit of one bag for every two bare root fruit trees purchased and picked up, now through January 16th. Use it to mix with the wet soil to ensure good fill of dirt around the roots of your bare root fruit trees. 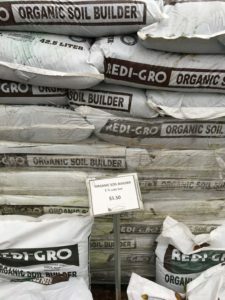 Must purchase and pick up trees and soil now through January 16th for special price on soil. We cannot hold trees and amendment for this special. 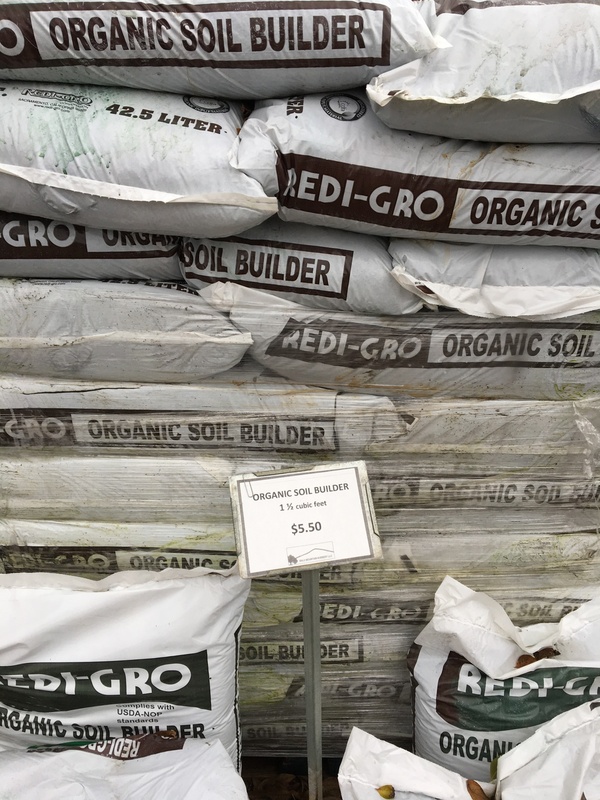 Special price on soil amendments good through January 16th only. Bare root fruit trees are regular price. 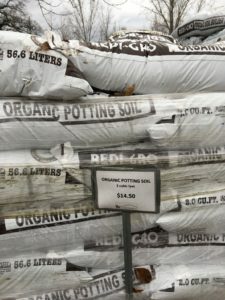 Organic Soil Amendment 1.5 cf. Regular price $5.50. Bare Root Berries and Blueberries and Artichokes, Asparagus, and Rhubarb are now in. Pomegranates $15.00 – Eversweet, Parfianka, Pink Satin, Wonderful. Figs $18.00 – Black Jack, Black Mission, Brown Turkey, Conodria, Kadota. Thornless balckberry, Olallie Blackberry, Boysenberry – $6.50 ea. Heritage Raspberry, Canby Red Raspberry, Fall Gold Raspberry – $4.50 ea. Artichokes, Greeen Globe – $4.95 ea. Artichoke, Jerusulem – $1.50 ea. Rhubarb, Victoria Cherry – $4.00 ea. Yellow, Red and White onions – $1.60 / pound, Sweet onions – $4.00 / pound. Well the first weekend of fall did not really feel like it but after the nice soaking rain we just had and the cooler temperatures, it feels like fall. This is a great time of year and as we always tell our customers it is the best time to plant. Trees and shrubs get established without the heat but before the cold and are set to put out new growth in the spring with well established roots that will take them through their first summer without the stress from the heat that a plant with a less established root has. Trees are starting to show fall color now with the cool nights so you can see what color you will be getting when you buy your trees. The selection is good and the colors will be beautiful over the next few weeks. Fall is also the time to plant bulbs for spring color. Tulips and daffodils are available now and we have them on sale at 20% off for the month of October. Daffodils are deer resistant and gopher resistant and will naturalize in this area. When planting them use a bulb food or phosphorous in the bottom of the hole to encourage the root development. Tulips are also available for planting now. However you do need to protect them from gophers. Line the whole with a gopher basket or wire to protect them or the gophers will eat them. We are having a bulb planting clinic on Saturday October 8th at 10 am. If you have fruit that has fallen off your fruit trees that you were not able to use be sure to clean it up regularly. Fallen fruit and leaves should be cleaned up from under your fruit trees so they don’t give a place for fungus to grow. And don’t forget to plan for dormant spraying of your fruit trees. The three date to remember are Thanksgiving, Christmas, and Valentines day. Lime sulfer spray is no longer available so the spray to use for dormant spray is copper spray. We mix a dormant oil such as Saf-T-Side with the copper spray. We get better results than spraying the copper by itself because it helps it to cling to the tree rather than running off. It also helps to kill overwintering insects. Remember to spray three times during the dormant season to avoid leaf curl. If you have not done fall fertilizing, now is the time to get it done. The weather is cool and you want to get it done before plants go dormant. If the plants go dormant, then they do not utilize the fertilizer. This fertilizing is important since it helps with vigor going into the winter and gives them food to store for next spring that they will use when they first come out of dormancy. Plant your winter vegetables now. Get this done soon so they can get established before the weather gets cold. We have them available now. If you were not able to attend the winter vegetable gardening clinic, ask for the handout when you come to get your vegetables. Lots of good information in it. We will be getting our berries and artichokes and asparagus in November. Our bare root fruit trees will be available in January. We have the list of fruit trees and berries that we will carry available now. I am attaching a copy to this email but sometimes the attachment does not open. If that happens let me know and I can send you one via email. One final note. We love to here feedback from our customers. Let us know how we are doing. Ideas, suggestions, clinics you would like to see, anything you would like to say. We like to here from our customers on how we are doing or for anything else. We hope to see you soon for all your fall planting and gardening needs. Sign up to receive gardening tips and more in your inbox.